Every one might have got Timetable for finals. This time you might be thinking to get top marks, Worried about completing portion or syllabus within short period of time. Be cool and strong Here i got few useful tips for your worries. folloe them strictly and acheieve your goal, aim or wht ever. Prepare a list of all activities and books to read. Break your workload down into manageable chunks. Mainly Schedule your time realistically. Don`t skip classes near an exam -- you may miss a review session. Use that hour in between classes to review notes. Interrupt study time with planned study breaks. Begin studying early, with an hour or two per day, and slowly build as the exam approaches. Sort the syllabus, Materials, books. Identify the most important topics emphasized, and areas still not understood. Previewing saves time, especially with non-fiction reading, by helping you organize and focus in on the main topics. Adapt this method to your own style and study material, but remember, previewing is not an effective substitute for reading. Attack! Get actively involved with the text as you read. Ask yourself, "What is important to remember about this section?" Take notes or underline key concepts. Discuss the material with others in your class. Study together. Stay on the offensive, e specially with material that you don`t find interesting, rather than reading passively and missing important points. Simplifying: An effective way to simplify and make information more meaningful. For example, suppose you wanted to remember the colors in the visible spectrum (Red, Orange, Yellow, Green, Blue, Indigo, Violet); you would have to memorize seven "chunks" of information in order. But if you take the first letter of each color, you can spell the name "Roy G. Biv", and reduce the information the three "chunks". Meaning full : Any memory-assisting technique that helps us to associate new information with something familiar. For example, to remember a formula or equation, we may use letters of the alphabet to represent certain numbers. Then we can change an abstract formula into a more meaningful word or phrase, so we`ll be able to remember it better. Sound-alike associations can be very effective, too, especially while trying to learn a new language. The key is to create your own links, then you won`t forget them. Check yourself while you are closing your books. Make up questions about key sections in notes or reading. Keep in mind what the professor has stressed in the course. Examine the relationships between concepts and sections. Often, simply by changing section headings you can generate many effective questions. For example, a section entitled "Bystander Apathy" might be changed into questions such as: "What is bystander apathy? ", "What are the causes of bystander apathy? ", and "What are some examples of bystander apathy?" Review. After reading a section, try to recall the information contained in it. Try answering the questions you made up for that section. If you cannot recall enough, re-read portions you had trouble remembering. The more time you spend studying, the more you tend to recall. Even after the point where information can be perfectly recalled, further study makes the material less likely to be forgotten entirely. In other words, you can`t over study. However, how you organize and integrate new information is still more important than how much time you spend studying. Avoid Mental Exhaustion. Take short breaks often when studying. Before a test, have a rested mind. 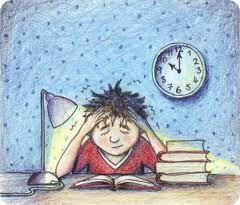 When you take a study break, and just before you go to sleep at night, don`t think about academics. Relax and unwind, mentally and physically. Otherwise, your break won`t refresh you and you`ll find yourself lying awake at night. It`s more important than ever to take care of yourself before an exam! Eat well, sleep, and get enough exercise.